MIKE BELLAFIORE is a cofounder of SMB Capital, a proprietary trading firm in New York City. He has had numerous trading articles published in SFO Magazine. SMB regularly appears on CNBC and TheStreet.com. SMB also hosts four trading shows a week on StockTwits TV, the first Web-native finance television network. 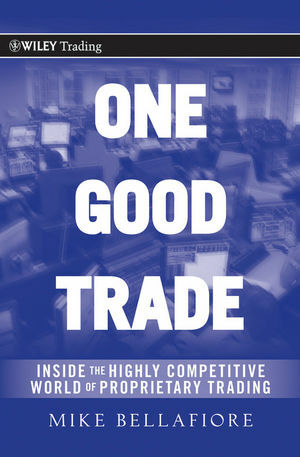 Bellafiore's trading strategies have been featured in Brett Steenbarger's book, The Daily Trading Coach, and his trader training program was recently highlighted in Trader Monthly and on the TV documentary Wall Street Warriors. Bellafiore is a regular contributor to the SMB blog, which provides market stories and trading advice. He was a speaker at the 2009 Traders Expo in New York. Bellafiore is a graduate of the University of Connecticut School of Law and a former member of the University of Connecticut Board of Trustees. PART I Inside a Prop Trading Firm. CHAPTER 1 These Guys Are Good. CHAPTER 2 One Good Trade. CHAPTER 3 A Good Fit. PART II Tools of Success. CHAPTER 4 Pyramid of Success. CHAPTER 5 Why Traders Fail. CHAPTER 6 Live to Play Another Day. CHAPTER 7 Stocks In Play. CHAPTER 8 Reading the Tape. CHAPTER 9 Maximizing Your Profits with Scoring. PART IV The Trader's Brain. CHAPTER 11 The Best Teacher. CHAPTER 12 Adapt to the Markets. CHAPTER 13 The Successful Trader.